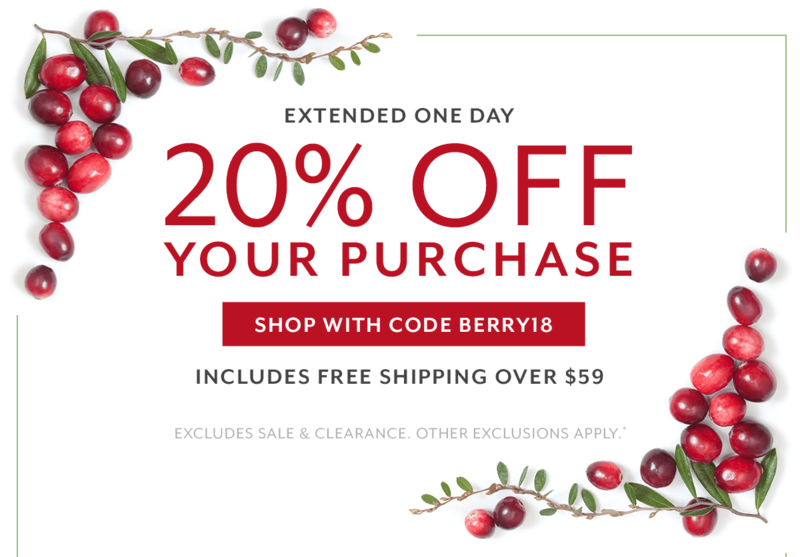 *20% OFF YOUR PURCHASE: To receive discount, present this page at time of purchase in store or enter code BERRY18 at checkout online. Limit one discount per customer. 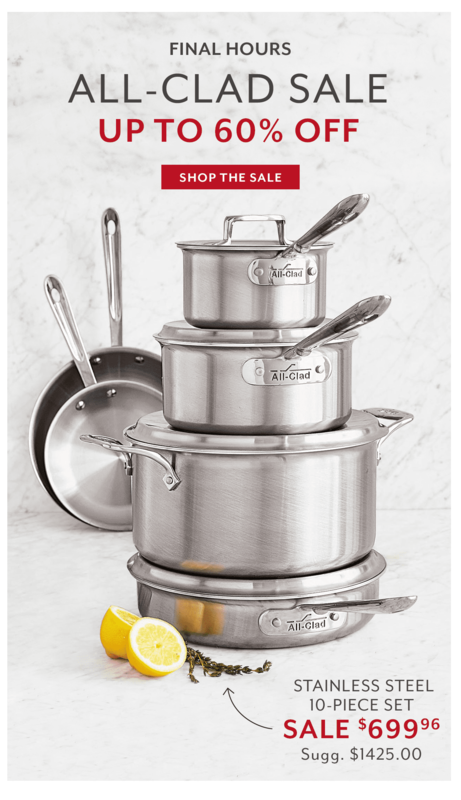 Excludes sale and clearance (items with prices ending in 6 or 9), gift cards, prior purchases, and gift-wrap. Excludes products shipped directly from vendor. One-time use only. Cannot be combined with any other offers or discounts. Not redeemable for cash. Valid online and in stores through 11:59PM (PT) on 12/11/18. No adjustments to prior purchases. 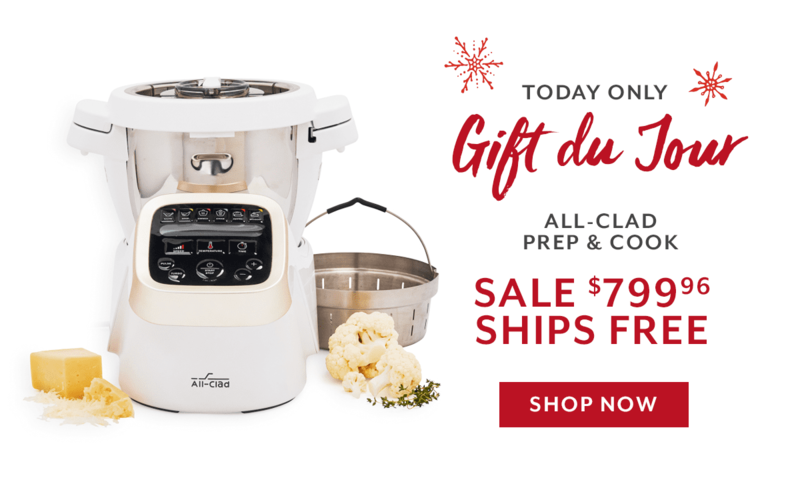 The following brands have chosen not to participate in this promotion: Bob Kramer by Zwilling, Breville, Coravin, Demeyere, Emile Henry, Global, Instant Pot, Joule by ChefSteps, Jura, KitchenAid Pro Line, Le Creuset, Mauviel, Miyabi, Riedel, Scanpan, Shun, Staub, Technivorm, Thermapen, Vitamix, Wolf Gourmet, Wüsthof and Zwilling J.A. Henckels. FREE SHIPPING ON ORDERS OF $59: Free shipping will be automatically applied to qualifying purchases of $59 or more when using code BERRY18. Valid for shipments bound to a single destination only within the continental United States. Rush shipping and vendor shipping surcharges still apply. Other restrictions may apply. Additional shipping charges apply to AK, HI, Puerto Rico, U.S. Virgin Islands and Guam. Free shipping will be automatically applied to qualifying purchases of $59 or more when using code BERRY18. Valid for shipments bound to a single destination only within the continental United States. Rush shipping and vendor shipping surcharges still apply. Other restrictions may apply. Additional shipping charges apply to AK, HI, Puerto Rico, U.S. Virgin Islands and Guam. Free shipping will be automatically applied to qualifying purchases of $59 or more when using code BERRY18. Valid for shipments bound to a single destination only within the continental United States. Rush shipping and vendor shipping surcharges still apply. Other restrictions may apply. Additional shipping charges apply to AK, HI, Puerto Rico, U.S. Virgin Islands and Guam.